their seeds and their skin and not for their pulp. Apparently these pumpkins tasted so rough you could not eat them, while their seeds were sweeter. Gradually, varieties of higher quality of pulp were developed. Traditionally, pumpkin seeds have been used for medicinal purposes to combat intestinal worms and to eliminate fluid retention in the body. Chinese medicine has used them to get rid of excess mucus in the respiratory system. From an nourishing point of view pumpkin seeds are rich in unsaturated fatty acids. There is even a special oil, called oil of Styria, which is produced in the Austrian region of Styria from the from the toasted pumpkin seeds of the variety Cucurbita pepo var. styriaca. This oil is sold in health food stores. 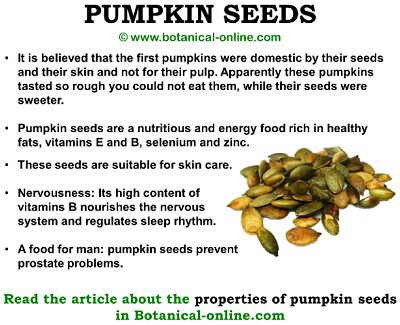 To eat pumpkin seeds will contribute to a good amount of essential fatty acids Omega-3 and Omega-6. First, it provides very important advantages for the health such as the diminution of the cholesterol, the hypertension, the diminution of the inflammation in arthritis or breast cancer. The Omega-6, besides being very beneficial also for the circulatory apparatus, has properties for the treatment of the negative symptoms of the pre-menstrual syndrome. This food contains high amounts of vitamin A, vitamin E, and most minerals, especially zinc. Its antioxidant power makes it a good resource for keeping cells healthy and prevent the degenerative impact that free radicals have on them. Pumpkin seeds help to keep the body younger, to help prevent prostate enlargement, decrease or reduce the risk of developing cancerous tumors. They also contribute to good skin, aiding in the healing of wounds or events such as acne. Naturally, their high level in oils gives pumpkin seeds a wealth of calories. Therefore, we must be prudent in their use especially in cases of obesity. Eaten in moderation, it can satiate the hunger and provide all its richness in trace elements. It is necessary to consider that they should be opened right in the moment of consumption, since they get stale easily. When using the seed-seed oil, it should be used cold.